Cholesterol is a lipid soluble, sterol compound occurring naturally inside the human body. In addition to the dietary cholesterol, it is also synthesized inside the human body and is one of the essential components of cell membranes. Cholesterol is an essential structural component of cell membranes and functions for maintain the stability of cells. It is required by the human body to synthesize vitamin D.
It is one of the chief components of bile acids and required for synthesis of cholic acid and chenodeoxycholic acid in the liver. Cholesterol is the main compound from which steroid hormones, for e.g. Testosterone, are produced. High cholesterol or hypercholesterolemia is a condition in which serum cholesterol levels are elevated more than 200 mg per 100 ml (dL). A reading between 200 and 239 mg/dL is labeled borderline high and a reading of 240 mg/dL and above is considered high. Medications like Thiazide diuretics, progestogens, etc. Cholesterol and triglycerides circulate as lipoproteins in the blood. The protein component of lipoproteins is called apolipoproteins. Chylomicrons (carries 2-7% of cholesterol). Research studies suggest that high cholesterol levels in the blood have been found associated with coronary artery disease, stroke, and peripheral vascular disease. It is also found that adult cardiovascular disease may have its roots in childhood and adolescence. Normally about 35-50 g of cholesterol is present inside an average size adult at any time. Low density and very low density lipoproteins (LDL and VLDL) are synthesized by the liver. LDL carries nearly 50% of cholesterol. It is this lipoprotein that elicits injury in the coronary blood vessels and lead to the atheroma plaque formation. 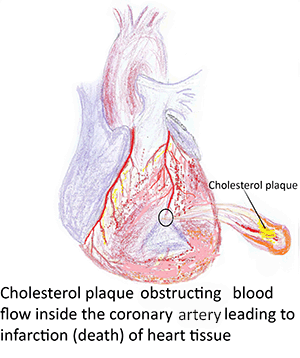 Atheromatous plaques block smooth flow of blood in coronary vessels which leads to heart attacks. For the reasons described above, LDL cholesterol is also called as bad cholesterol. High density lipoprotein (HDL) is synthesized by the liver and small intestine. HDL contains phospholipids and proteins (Apo-A) which accept cholesterol and esterifies it. HDL, thus, facilitates reverse transport of cholesterol from peripheral tissues to liver and helps in its excretion through bile. Normal HDL levels aim to reduce blood cholesterol levels. Thus HDL is labeled as good cholesterol. Serum lipids should be estimated after 8 hours standard fast as food intake leads to large variation. Screening for hyperlipidemias should be undertaken in all high risk cases. If the serum cholesterol levels is less than 170 mg/dL, no treatment is required except revaluation at frequent intervals. If serum cholesterol level is between 170-200 mg%, do lipid profile test. If it is more than 200 mg%, lipid profile followed by treatment by drugs should be considered. However, serum LDL-cholesterol should be aimed below 130 mg%. In high risk cases such as diabetes, family history of cardiac disease, LDL should be aimed below 100 mg%. The golden rule is that for better compliance, all the family members should switch over to the low fat diet. Step-I diet: When LDL cholesterol is more than 130 mg%, give step I diet with 30% of total calories from fat with equal proportion of saturated to monounsaturated to polyunsaturated fat. Restrict cholesterol to 300 mg/day. However, high risk patients such as diabetes, family history of cardiac disease, etc, treatment should be initiated even if the LDL cholesterol is more than 100 mg% and put on step II diet. Step II diet: When the LDL cholesterol is more than 130 mg%, give step II diet with only less than 7% of calories from fat. Restrict cholesterol to less than 200 mg/day. Encourage fruits, vegetables, fish oils etc. Mushrooms are fat free food items with sufficient minerals and vitamins Skimmed milk powder can be used instead of ordinary milk. Ensure high fiber diet which has cholesterol lowering properties. Avoid hydrogenated vegetable oils which contain trans fatty acids. Avoid butter, oil, cheese, milk cream, refined sugar, bakery items. Avoid eating in between meals. Antioxidants like vitamin-C, Beta carotene, and vitamin-E have protective role against heart disease. Green tea is a good source of antioxidants. Maintain ideal body mass index of 18.5 to 24.9. Live stress free, healthy lifestyle. <<-Also Read on Trans fats. Also read...->>list of recommended fats and oils. Heart Foundation-Food and Nutrition. pdf.